The rise in popularity in the use of neodymium magnets as desktop ornaments and toys have lead to a rise in ingestion related injuries for toddlers and preteens. In a study presented at the American Academy of Pediatrics (AAP) National Conference and Exhibition in Orlando, 2,700 ingestions were observed over a ten year period and it was revealed that ninety four of the cases involved magnet ingestion. The study also revealed that cases of magnet ingestion increased in the last three years of the study with the age of patients ranged from 7 months to 13 years. Neodymium magnets are the most powerful magnets around. A neodymium magnet a few cubic centimeters small can cause bodily harm from pinching to even causing broken bones. Magnets have been a popular accessory for preteens where they use the magnetic property to simulate a tongue stud, nose ring, or earring. This kind of use can lead to accidental ingestion or inhalation. Once ingested, they can cause the digestive tract to fold when pinched by two of these magnets which causes internal injuries or even death. The continued sale and availability of powerful, neodymium magnets—typically 10 to 20 times stronger than traditional magnets— are causing an increase in pediatric ingestion-related injuries, according to an abstract presented Sunday, Oct. 27, at the American Academy of Pediatrics (AAP) National Conference and Exhibition in Orlando. 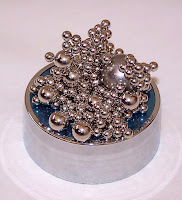 Neodymium-iron-boron, or "super" magnets, became available in the early 2000s in toys, jewelry and other novelty items. In the late 2000s, they exploded in popularity in the form of novelty desk toys aimed at adults. In 2012, the U.S. Consumer Production Safety Commission (CPSC) banned the future sale and issued a product recall of supermagnet desk toys. This came in the wake of several multiple magnet ingestions that resulted in numerous cases of pediatric bowel perforation, sepsis and even the death of one child. While supermagnet toys are no longer marketed to small children in the U.S., they remain available online, and can still be found in adult desktop toys and other products bought before the recall. Canada has recently implemented a mandatory recall on some of these products and also banned their sale. In the abstract, "Supermagnet Ingestion—an Emerging Pediatric Threat," Canadian researchers sought to determine the frequency of magnet-related injuries in small children at a major, urban medical center. Researchers reviewed data on all foreign body ingestions in children ages birth to 18 years who were treated at The Hospital for Sick Children (SickKids) from April 1, 2001, to Dec. 21, 2012. Out of over 2,700 ingestions over a 10-year-period, 94 involved magnets. Although the first recorded magnet ingestion occurred in 2004, the data shows a significant increase in both single and multiple magnet ingestion, with multiple magnet ingestion increasing the most in the last three years of the study. The age of patients ranged from 7 months to 13 years with a mean age of 4.5 years. Sixty-five percent were boys, compared with 35 percent girls. The magnets were removed surgically in six patients, and endoscopically in 10 patients. No deaths were reported. "The research we're presenting at the AAP conference confirms what we've suspected," said study co-author Daniel Rosenfield, MD, "that the ingestion of these dangerous toys has been increasing, and spiking over the past three years. What we're seeing is really an epidemic driven by a new technology. These new magnets are vastly more powerful, smaller in size, and seem innocuous. Parents just aren't aware of the potential danger." "Parents, teachers, physicians and the general public need to be made aware of the potential dangers, and assure that these toys are kept away from children," Dr. Rosenfield said. "We applaud governmental bodies in the U.S. and abroad for taking a strong stance in removing these products from the market."